Since everyone was unhappy, they decided it would be a good idea to go back to rereleasing existing rare items. For the 5th, they rereleased Scary Cat Hats. And for the 6th, they rereleased Viking Hats. Before this, some colors of viking hats were ~3 of a kind so they were very very rare. They haven't been sold since beta before this! We get a new clothing item in Jam Mart Clothing fairly often. Why not take one of those items and slap a rare tag on it instead of releasing it as a normal item? "omg i wonder what rare item will be! i hope it's a black and orange fox hat!" "oh, it's a green and orange Pizza Prep Station Hat. What even is a Pizza Prep Station Hat????" None of these items are even rare! I know they're supposed to be rare version of existing items, but almost all of them are available in adventures! In other words, they're all still available to get without trading, right now. Like 99% of the possible prizes in the Epic Chest in Lucky Clovers are items from Rare Mondays. Everything I got from the gifts on the Daily Spin were Rare Monday Items. Most of the stuff I get from playing eagle quest is complete junk that's still for sale, but occasionally I get Rare Monday Items. Some of the stuff in Return of the Phantoms are Rare Monday Items. Most of the junk in my inventory are Rare Monday items. My grandma's AJ account is filled with Rare Monday items, and she doesn't even have an account! You see where I'm going with this? "Rare" Monday items are everywhere~! EDIT: I forgot to bring up the cupcake hats again. 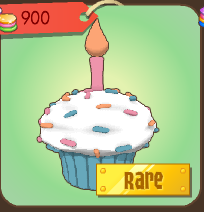 Rare Cupcake Hats have been released as rare monday items at least 3 times! If they're going to rerelease a rare monday item, they should at least change it a little bit! I agree with everything you've just said. The eagle quest was the stupidest idea of the century and AJ is stupid now because of it. And the purple and green is so GROSS!!! Anyway,I agree, and I don't bother buying any of this garbage any more. I know! Let's start a riot!!!!1!!!!!! HEY! I JUST HAD A GREAT IDEA! AJHQ SHOULD MAKE LONG SPICED GARBAJE COLLARS THE RIM! 99.9999999999999999999999999999999 PERCENT OF THE GAME WILL QUIT, AND THE .000000000000000000000000001 PERCENT THAT IS US WILL BE HAPPY! OMG YAYAYA WE CAN TAKE OVER AJ! people: OMG AJ BRUGHT BAK BHETAS AND RARZ ERMEHGERSH IM QUITTING! Meloota you should make a post on bringing back headresses to the stores so Jooleantoo makes a video on it and ajhq goes with it. Then still make it and hope another famoose person makes a vid on it!! Finished go check it out and tell me wht I need to fix?? Do you want me to remove the spiked wristbands on the sides or not? Is that okay? If so, do you have a preference? What size do you want the words "an animal jam challenge?" Can you change the "an animal jam challange" to red maybe? ok u on now ? ?